side effect s were experie nced during the t herapy. plication for hemodialysis patients [1-3]. Kihara et al. experimentation. All subjects provided informed consent. *The author declares no conflict of interest. Heart Association (NYHA) before and after this study. tients are summarized in Tables 1 and 2, respectively. score was improved in all patients (Table 2). side effects were experienced during the therapy. Table 1. Demographic characteristics, and present heart disease and other conditions of the study population. mitral valve regurgitation, OMI old myocardial infarction, PKD polycystic kidney disease, SN sclerosis nephropathy. Table 2. 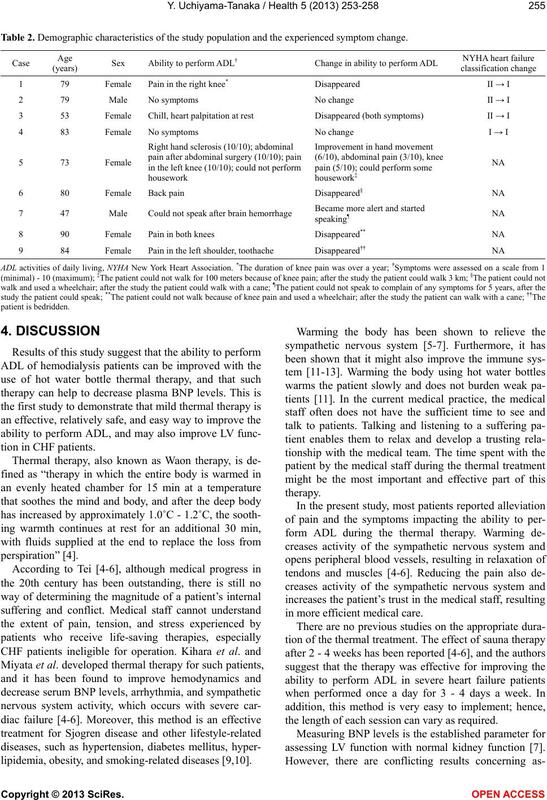 Demographic characteristics of the study population and the experienced symptom change. lipidemia, obesity, and smoking-related diseases [9,10]. in more efficient medical care. the length of each session can vary as required. assessing LV function with normal kidney function . evaluation of diastolic LV function remains controversial. tion that was followed up for a very limited duration. 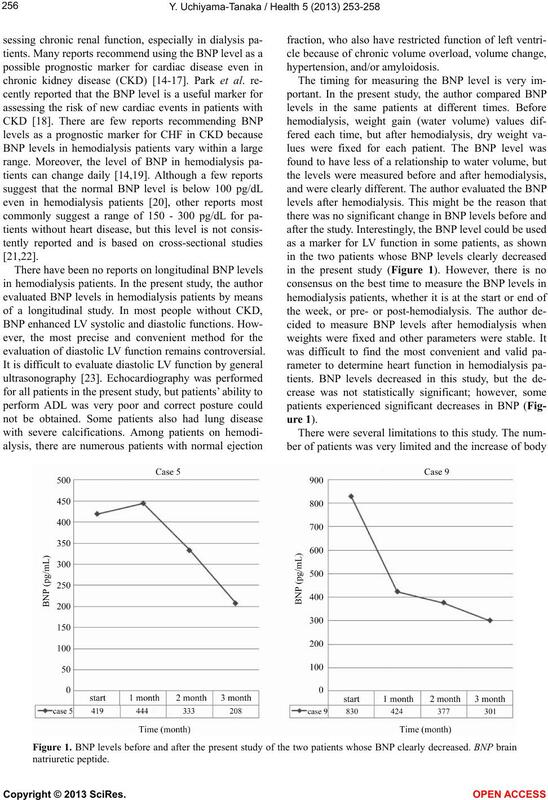 plasma BNP levels in hemodialysis patients with CHF. red dry sauna with hot water bottle thermal therapy. 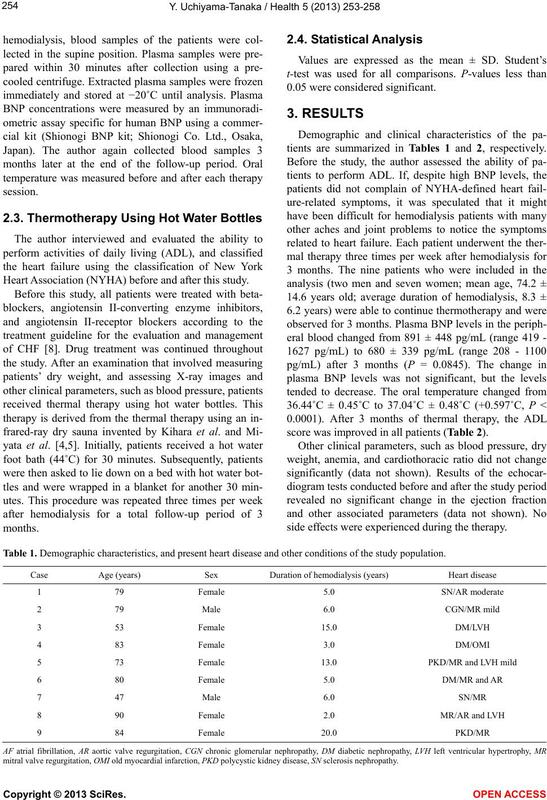 therapy using hot water bottles. toms and ability to perform activities of daily living. sponsibility for the integrity of the work as a whole. provided the original author(s) and source are credited. heart failure. 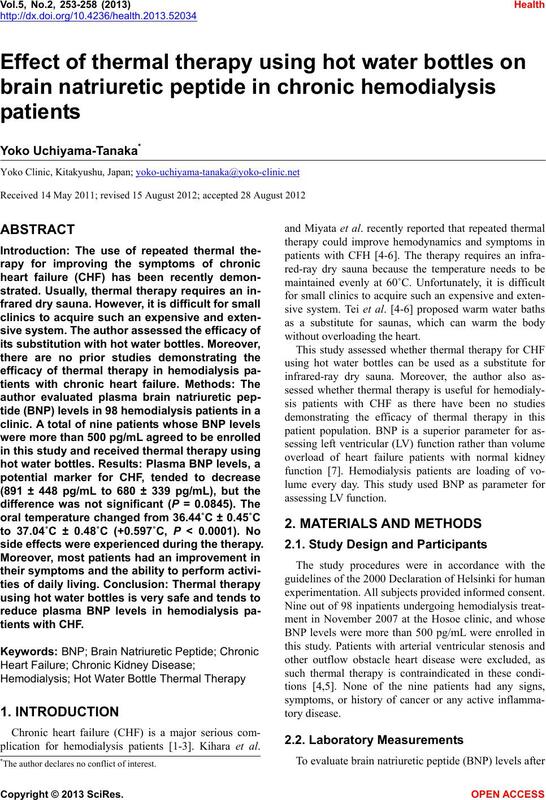 Journal of Cardiology, 53, 214-218.
heart failure: Results of a prospective multicenter study. 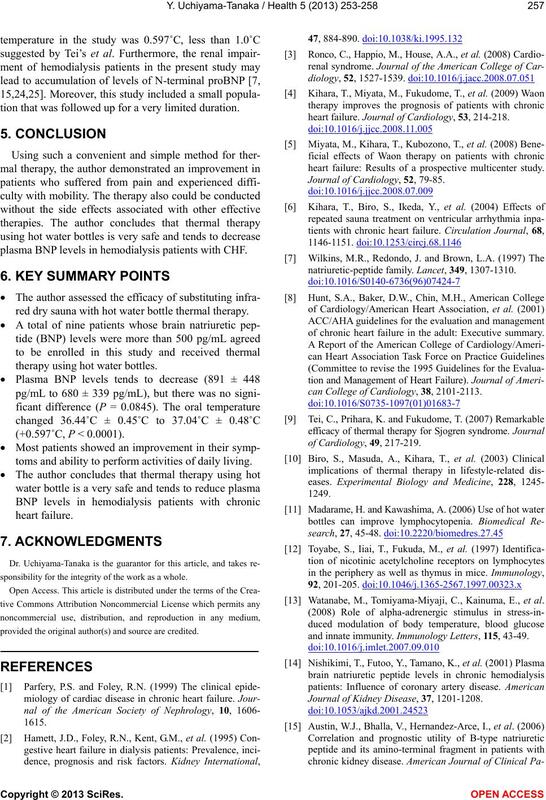 Journal of Cardiology, 52, 79-85.
natriuretic-peptide family. Lancet, 349, 1307-1310.
of chronic heart failure in the adult: Executive summary. can College of Cardiology, 38, 2101-2113. Watanabe, M., Tomiyama-Miyaji, C., Kainuma, E., et al. and innate immunity. Immunology Letters, 115, 43-49. 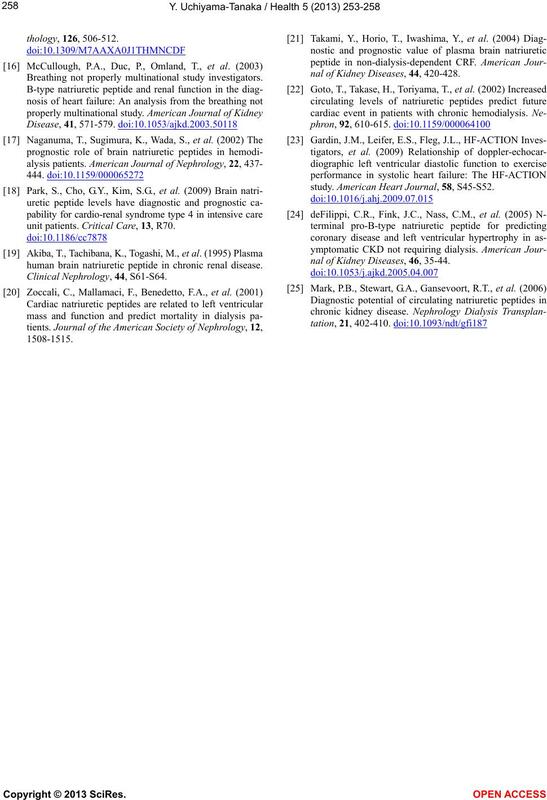 Journal of Kidney Disease, 37, 1201-1208. Breathing not properly multinational study investigators. unit patients. Critical Care, 13, R70. human brain natriuretic peptide in chronic renal disease. nal of Kidney Diseases, 44, 420-428.
study. American Heart Journal, 58, S45-S52. nal of Kidney Diseases, 46, 35-44.